WE HAVE COMPLETELY RENOVATED OUR BATHROOMS AND KITCHEN. SEE VIDEO. EACH BATHROOM HAS NEW TILED WALK IN SHOWERS, WITH FRAMELESS GLASS DOOR, NEW VANITY CABINETS WITH QUARTZ COUNTERTOP, NEW SINKS, FAUCETS,NEW TILED FLOOR, NEW TOILET,MIRRORS. MASTER BATHROOM ALSO HAS A NEW TUB.. KITCHEN HAS NEW CABINETS, GRANITE, STAINLESS STEEL APPLIANCES. WE CAN ACCOMMODATE FAMILY OF 6 OR TWO COUPLES EACH WITH OWN MASTER BEDROOM. SHARE YOUR FUN AND REDUCE YOUR COST! Our beautiful, spacious 1442 square feet, centrally air conditioned two bedroom condo, Windsor Court N. 4302, is located on the third floor of a luxurious, gated five-story, direct oceanfront development, Windsor Court North, which is located in Palmetto Dunes Resort. There are many Windsor Court condos listed with VRBO but the condos are not comparable since they may vary in the ocean view, level of furnishings and condition of the furnishings and floors. Some condos have the ocean views obstructed by trees or the pool houses and certain units may show more wear and tear with tired looking furniture and kitchen appliances. Our condo has unobstructed ocean views, ceramic title floors, handmade area rugs, designer selected furniture ,all in excellent condition, new kitchen cabinets, granite countertop with glass splash back,stainless steel sink,faucet and kitchen appliances and renovated bathrooms with new custom tiled showers,frameless glass doors, quarz countertops on new vanities with new sinks, facuets, toilets and new tub.. Our unit is in a rental program that caters to discerning customers which requires we meet its high standards.We have paid attention to the small details for your comfort, such as fine china, reading lamps,lounge chairs for the balcony, wireless internet, a vanity set in the bedroom, flat screen HD tv's, and new mattress for master bedroom. . If you are a discerning consumer who wants both quality and value, such as our discounted prices, and no disappointment when you arrive in Hilton Head, our condo is for you. From our condo you are steps away from the ocean and the beach, and a short walk away from two premier hotels, The Omni Resort and the Marriott Hotel, which offer fabulous restaurants, a health club and spa and lively evening entertainment. We now have a walkway over the dunes from the pool area to the beach that has no steps--easy for bicycles and strollers. Our condo has been professionally decorated to give our guests a first class visit and the combination of 9 ft ceilings with ceilings fans in each bedroom and the living room, Tommy Bahama décor, handmade Oriental area rugs in each room, Asian artifacts, exquisite furnishings and serene ocean views creates a true island atmosphere. We have beautiful ceramic floors in our bedrooms ,living room, kitchen, dining room and laundry room, as well as stainless steel appliances (including stainless steel dishwasher purchased in August 2018) with glass backsplash, granite countertops, stainless steel sink and pull down faucet, in the kitchen. What truly gives you the sense of being on an island when in our condo is that from every room, whether standing in the kitchen, relaxing in the living or dining room or in either bedroom suite,you have stunning beach and ocean views. Our kitchen comes fully equipped and offers an eat-in bar for 2 from which you have spectacular ocean views. Right off of the kitchen there is a laundry room, with a full sized washer and dryer purchased in August 2018 along with iron and ironing board. Linens and towels are provided. The dining room, which also has terrific ocean views, seats up to 6 and opens to a gorgeous living area complete with queen-size sleeper sofa, loveseat, recliner, a 47 inch flat screen HD LCD TV, DVD, stereo system, and wonderful views of the Atlantic. The large master suite has a king bed, 26 inch flat screen HD LED/LCD TV, DVD, walk-in closet, vanity set including table, mirror and chair, a private bath and of course, fabulous ocean views. The master bathroom has a new tub, expanded glass tiled shower with frameless glass door, new cabinets with quartz countertops, new sinks, faucets, toilet, new tiled floor, new mirrors and lighting. Our guest suite is furnished with a king-swing bed that can be divided into 2 twins upon request. This suite also has a 22 inch flat screen HD LCD TV. DVD, a walk-in closet, and a private bath with terrific ocean views. The guest bathroom has an oversized tiled shower with frameless glass doors, new tiled floor, new cabinets with quartz countertop, new sinks, faucets, toilet, new mirrors,lighting. Off the living area and guest bedroom suite is a great oceanfront balcony. Here, you will find a table with chairs that seats 4, small glass top cocktail table and 2 reclining sling back lounge chairs, making it a perfect spot for viewing the sunrise over the Atlantic. No detail has been spared in our VIP Hilton Head villa! We visit often, and are responsive to comments from our guests about how we can make their next stay even more enjoyable. DSL/wireless, high-speed internet and telephone calls anywhere in the U.S,, Canada and Puerto Rico is also available for you at no additional charge. Windsor Court North provides a ground floor, covered parking garage, along with an elevator for easy access to all five floors. There is a private pool complex for residents and guests which is comprised of a large pool, seasonally heated, with children's playground, an expanded new kiddie pool , large hot tub, restrooms, and covered gazebo area for shade with built in BBQ grill for poolside dining or cocktails. We also have a quiet reading deck on the dunes to enjoy during the day and a fire pit to enjoy in the evening. While you are staying at our condo, you can enjoy having the amenities of rental bikes to ride on the quiet, very wide beach in front Windsor Court North, the tennis courts and golf courses, all conveniently located in the Palmetto Dunes Resort. You can also take advantage of the free Palmetto Dunes Buggy which, on demand, will take you around the Palmetto Dunes Resort and over to Shelter Cove Marina, across highway 278 from Palmetto Dunes Resort, which has wonderful restaurants, a variety of shops and nightly entertainment. Our unit is listed with one of the premier rental companies on the island,so you not only have the benefit of receiving from this website a discounted VRBO rate but also the comfort of knowing that we are required to maintain our condo in pristine condition, and that there is on-going onsite inspection to make sure that any item that requires attention is taken care of. Our local agent will be available to answer any of your questions, to provide assistance, and to provide you with a pass to go through a gate with 24 hour live security on duty in order to reach Windsor Court North. Keyless entry now available. 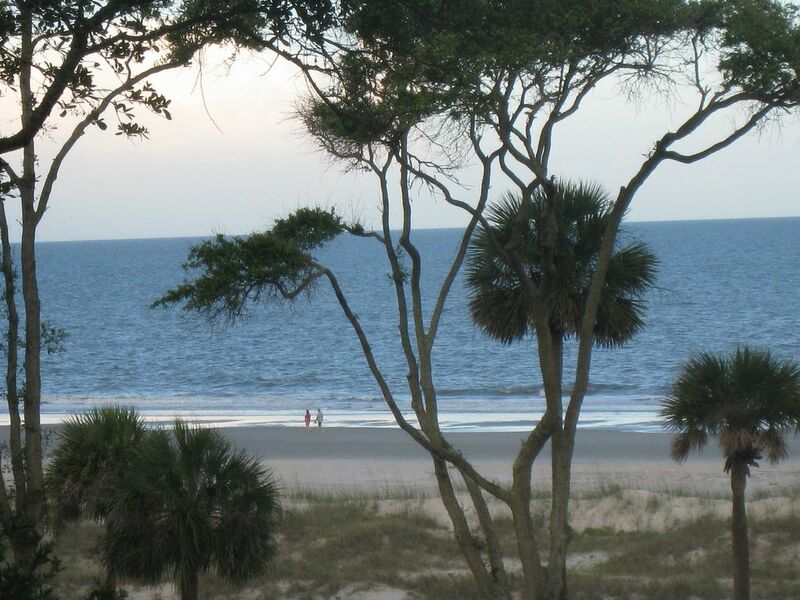 We love spending time in our condo on Hilton Head, and know you will enjoy being in our home as much as we do. Please no smoking or pets. Condo association imposes fines for guests bringing pets. Thank you. We love entertaining guests in our homes, and always want our guests to have a 5 star experience when staying in our homes. We ourselves like our environments to be aesthetically pleasing, be in excellent condition, provide comfort and ease. After we purchased we enjoyed working with a decorator to create a relaxed, island ambiance with Asian and Hawaiian accents, where we have enjoyed traveling. We are excited about our new upgraded kitchen with new cabinets,granite counter tops,stainless steel sink and faucets. Our bathrooms were renovated in 2019 to have new tiled showers with frameless glass doors, new tiled floors,, new cabinets with quartz countertops, new mirrors, lighting. The Master bath also has a new tub in addition to the expanded frameless glass shower. We keep past and future guests up to date about improvements to our condo and events on Hilton Head through Facebook,Twitter and Pinterest. We wanted a property which was in a gated community, is oceanfront, has fabulous ocean views from each room, was convenient to the beach, has covered parking, tennis and golf nearby, has a pool and hot tub. We are centrally located near excellent restaurants and cultural activities. We have been coming to Hilton Head since 1978, purchased our first ocean front property in 1981 and upgraded to Windsor Court in 2003. We enjoyed watching our children play on the wide Hilton Head beaches and gentle surf, then as grandparents enjoyed watching our grandchildren do the same thing. Our condo is perfect for multi-generational vacations with 2 separate master bedrooms on opposite ends of the apartment. In 2017 we renovated our kitchen and in 2018-19 we renovated our bathrooms. As retirees we enjoy being close to the Coastal Arts Center for live theater, to Park Plaza and Northridge Cinemas for movies, to the Jazz Corner for jazz and cabaret, and now we enjoy the Metropolitan Opera HD Broadcasts at a theater in nearby Bluffton. In addition to the cultural activities, we enjoy the swimming, golf, tennis, biking and just walking along the beach. Easy access from underground parking to elevator or from underground parking to pool or to beach over the walkway over the dunes which has no steps. We stayed at Windsor Court North #4302 The unit was great. Loved the newly remodeled bathrooms as well as kitchen. View was fantastic!!! We called about a broken blender and a in one hour we received a brand new blender for the unit.Lovely Vacation. We stayed at 4302 Windsor Ct. for the month of February 2019. It is a beautifully decorated condo with many property amenities. The view of the ocean was beautiful with views of the sun rise ☀️ We enjoyed the hot tub, grills and fire pit. The condo is newly updated with beautiful bathrooms and kitchen. The master bedroom has a new, very comfortable mattress. The management company was very responsive and helpful. I would highly recommend this beautiful property. We are surprised at the comments on the pillows and mattresses because other guests have written reviews complimenting us on how comfortable the bedding was during their stay. See the review submitted June 11, 2018 by Diane H where she said the master bed was the most comfortable she ever stayed on. Mattresses , whether hard or soft, are a personal choice . We are constantly upgrading and improving . We just purchased a new full size washer and dryer and dishwasher To insure the comfort of our guests we purchased 10/2018 a new Simmons Beautyrest Silver mattress. Although our pillows were the luxury Hotel Premium COllection we added two new king size Ralph Lauren pillows. We have never heard that the pool or elevator was too hot. We will communicate these comments to the management company which operates Windsor Court. Had a great stay! Would go back in a heartbeat. Steps away from beach resort had multiple pools one was zero entry. Close to general store which has everything you need. Great accommodations would recommend to anyone looking for vacation on Hilton Head island. Amazing views in a wonderful unit. Great location. We loved our stay in 4302 Windsor Ct. The views are amazing. The unit is wonderful with a beautiful kitchen with everything you could need. The location is great. Right off elevator and we never heard anyone outside the unit or any neighbors. Condo built very well. The master bed was the most comfortable we have ever stayed on and the power of the showers amazing. The pools are great here. Our girls loved them. You can rent umbrellas and chairs right on beach or use those provided in unit. You will love your stay here. We can’t wait to go back!! Our rental agent has established an exclusive partnership with Palmetto Bluff and May River Golf Club for our guests to have access to their highly acclaimed golf course. Our rental agent is also able to provide discounts for golf courses with Harbor Town Golf links as well as the Palmetto Dunes courses.